transmission are required; there are restrictions on the drive width; the installation and take-up allowances are minimal; and the drive is critical. Lawn & Garden belts are available in Blue, Brown, Grey, White and Black fabric identifiable with Lawn & Garden machinery, available in all standard section belts. 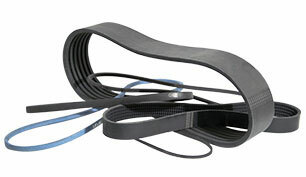 A&I Products offers a wide variety of belting options. A&I Products offers both RAPTOR™ Belting and Ideal™ Belting from WCCO. We strive to offer options for those looking for hi-performance heavy duty belting and also provide a lower cost high quality belting solution.